Moisture Register Products: Moisture Register Products’™ moisture analyzers are designed to measure and control moisture content in virtually any product or material. Systems includeonline moisture sensing, laboratory moisture analyzers, and portable handheld moisture meters. These instruments are designed for both general and specific applications. Our non-contact IR, nondestructive RF, and probe-type moisture meters help manufacturers, purchasing agents, and engineers achieve higher productivity, improved cost efficiency, and greater profitability by accurately measuring moisture in industries such as food, agricultural, pharmaceutical, chemical, paper, timber, converting, mining, aggregate, energy, plastics, recycling, and building, just to name a few. 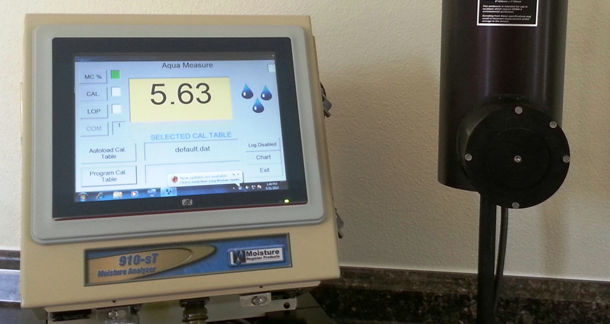 Moisture Register’s innovative moisture meters are ruggedly built and operate well in harsh manufacturing conditions. We use the latest near infrared (NIR), radio frequency (RF), and microwave technologies to produce accurate moisture readings from all of our moisture analyzers, including online process, laboratory, andhandheld moisture measurement and control devices. Moisture Register Products a division of Aqua Measure Instrument Co., offers moisture analysis solutions for a wide variety of materials and products, including many powder and bulk solids, almonds and other nuts, dried fruit, pet food, plywood, minerals, crushed coal, recycled paper, plastics, cosmetics, food products, and many other organic or carbon-based materials.